MISA SHIN GALLERY is pleased to present “Summer Show,” a group exhibition introducing works by our representing artists as well as works from the collection of the gallery. The exhibition will be held from Friday, June 24 to Saturday, August 13 6, 2011. The participating artists are Kimsooja, Torimitsu Momoyo, Back Seung Woo and Suhasini Kejriwal. The exhibition will bring together those artists of different backgrounds and locations. The exhibition presents the works, which has a role of reflecting their social environment and also a role of output of their characters inside. surrounding the Sun, reminds the viewer mandala. Torimitsu Momoyo lives and works in New York. Her works are mainly videos, installation and performances. “Somehow I don’t feel comfortable” is a large rabbit shaped balloon of 4.8 meters high. Torimitsu who had grown up in a suburb Tokyo during the rapid economic growth in Japan tells that a pink bunny was a typical figure, which represent “cuteness” and “happiness” in the Japanese society at the time. The bunny presents its cuteness even in its oversized body and trapped between the ceiling and the floor brings uncertainty about the future and irony to the viewer. Suhasini Kejriwal creates works, which one might describe fictional plants or creatures with vivid colors. The work, which will be exhibited attracts the viewer’s eyes to the details for the first sight. Gradually the viewer would experience the awakening of a deeply hidden unconsciousness. A sculpture of a bunch human fingers, together with the deep red flower petals on the top, the work rouses the concept beyond good and evil, people’s greed and eroticism. 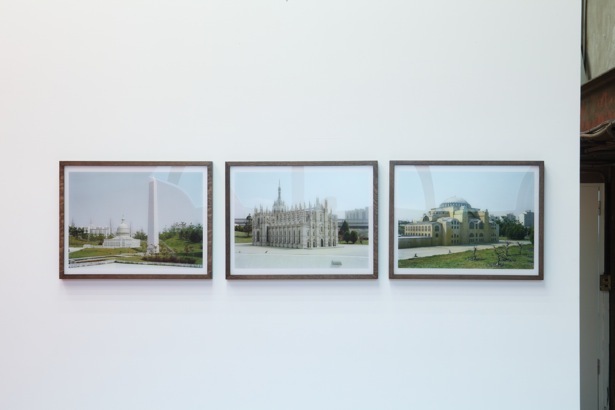 BACK Seung Woo’s “Real World I” is a set of photographs taken in the theme park in South Korea. They are straight photographs taken with a technique, which is commonly used for architectural photographs. However the unrealistic world created by miniature architecture in the photographs might be disturbing for the eyes of the viewer. What represented in the work is not the longing for foreign countries or culture, but it is a fantasy where reality and unreality has a vague border in between. Born 1957 in Taegue, South Korea. Lives and works in NY. Recent solo exhibitions include “kimsooja” at the Baltic center for Contemporary Art (England, 2010), “Earth – Water – Fire – Air” at the Atelier Hermes (Seoul, 2010) Kimsooja’s works are included in the permanent collection of Musee d’Art Contemporarin (Lyon) and elsewhere. Born 1967 in Tokyo. Lives and works in NY. Major solo exhibitions include “Thrust Projects” Jane Kim (NY, 2009), “Inside Track” at the Deitch Projects (NY, 2004). Torimitsu participated in a group exhibition, “All About Laughter“ at the Mori Art Museum (Tokyo, 2007). Born 1973 in Kolkata. Lives and works in Kolkata. Major solo exhibitions include “The Garden of Un-Earthy delights” at the Anokhi Museum (Jaipur, India, 2009), “An Advertisement for Heaven or Hell” at thte Chemould Prescott Road (Mumbai, India, 2009) . Born 1973 in South Korea. Works in London and Seoul. Major group exhibitions include “Photography Now China, Japan, Korea” at the San Francisco Museum of Modern Art (San Francisco, 2009) and “Dreamland” at the Centre Pompidou (Paris, 2010). A solo exhibition at Artsonje Center (Seoul) is currently on view.